This is an awfully good list. I’d be hard pressed to make any substitutions, but there are many many more that might make the cut, if I were but to try. I don’t think I will, though, but if anyone else would like to voice their opinions, that’s what this comments section is for. One thing I would like to mention is that the very first of these that I’ve read is the famous Locked Rooms essay by John Dickson Carr. I didn’t know it was coming, as a wonderful aside right in the middle of the novel, and it knocked my socks off. It made me a “fair play” detective story reader for life. And then came Haycraft’s book, and then all of the others. They all made me what I am today. My problem with The Guilty Vicarage is that it’s been applied to all English mystery, when even Auden himself says it’s about a particular brand of English mystery he liked: the English village mystery. Being a Barzunite I really would be remiss not to put in a word for Jacques Barzun. This is a mentally stimulating article! 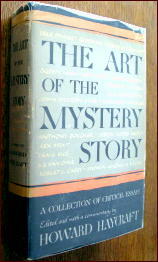 Wish S.S. Van Dine’s 35 page history of mystery fiction were included. It is THE pioneering survey of mystery fiction history. This is the Introduction and notes to his anthology The World’s Great Detective Stories (1928). “The Simple Art of Murder,” by Raymond Chandler, seems to be Chandler’s manifesto of what he wants mystery fiction to be. IMHO, it is not an accurate account of what mystery fiction or pulp or hard-boiled fiction actually was. 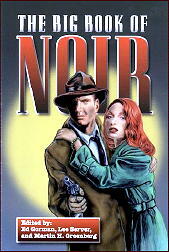 I don’t think it offers insight into either real pulp or real Golden Age detective fiction. Chandler’s essay is well-written, and its famous finale shows Chandler’s literary skills: he was a major prose stylist of the English language. But as an actual essay of ideas, it seems completely overrated. “The Guilty Vicarage: Notes on the Detective Story, by an Addict,” by W. H. Auden. This essay is one of the most quoted on detective fiction. But it is mainly quoted by people who hate Golden Age mystery fiction, to justify their hatred of the Golden Age. It is mainly a hatchet job. Once again, I seriously question if this essay is accurate, or offers any sort of realistic account of real Golden Age mystery fiction. And its subtitle is especially offensive. This essay is at the core of the description of people who read mystery fiction as “addicts”. This smear is a lie, and horribly offensive. It is used to smear people who admire Golden Age detective stories. People who like poetry or opera are not called addicts. Why should lovers of detective stories be subjected to this? There aren’t any single author studies on this list, of writers who aren’t hard-boiled. Couldn’t Francis M. Nevins’ book on Ellery Queen, ROYAL BLOODLINE, be a useful addition here – much better than the Auden? Israel Zangwill’s preface (1895) to THE BIG BOW MYSTERY is a landmark, discussing both impossible crimes, and what we now call “fair play” in mystery fiction (although Zangwill did not use that term). I’d not include Chandler’s essay. I agree with Mike — it’s not a true critical study and is as biased as Barzun’s A Catalogue of Crime is when one reads through Barzun’s snobby jibes at those who fail to deliver the detective novel as he sees it. I’m not such a fan of that bibliography as Curt is, but it has served as a very helpful reading guide and uncovered obscure writers I might never have encountered through my own sampling of the genre. I’d include Dorothy L. Sayers’ superior overview of the genre (up until the late 1920s at least) that serves as the introduction to the first Omnibus of Crime. That’s how I discovered the work of Isabel Ostrander, BTW. Also worthwhile is the introduction to Ellery Queen’s 101 Year’s Entertainment. Both are limited in scope by their publication dates, however. There should be at least one critical book by H.R.F. 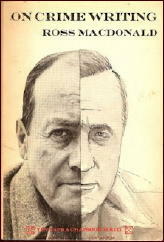 Keating who both admired and understood the genre and perhaps Robert Barnard’s book on Agatha Christie. I confess to not having read the Auden essay, and I should have. I’d have to read it before I know whether I object to being called an “addict” or not. Chandler’s essay has to be on the list, as it may be the most well-known of them all. It certainly isn’t objective, and it tells you as much about Chandler as it does about the art of the detective story. What it does make for, more than anything else, is fascinating reading. And Curt, this is where your own three part essay comes in. Thanks for including the link to Part One. Everyone here interested in Chandler should go read it. Josef’s list includes essays only, not full-length books, so CATALOGUE OF CRIME is automatically eliminated — except for the fact I can easily think of it as one long essay. It’s easy to see Barzun and Taylor’s biases, as frustrating as they are, and like you, John, I learned about a lot of lesser known authors from them. As any long-time reader of this blog should know full well, I’m a great fan of unknown and relatively obscure writers. That’s why I’m delighted to see Josef include such essays as Bill Pronzini’s on Gil Brewer and Jon Breen’s on Vin Packer. I think there is a difference between the ideal academic essay and the ideal literary essay. The essential quality of the academic essay is to tell the objective truth based on scientific knowledge. The quality of the literary essay is an interesting personal tone and prose style. Its view may be biased, as Chandler’s and Auden’s views are, may be provoking but should be fun to read. I also like to read academic essays on crime fiction but have confined my list to literary ones. By the way, I think that Auden calls himself an addict with some self-irony, and of course he would fans of poetry and operas call addicts as well, although because of different reasons. I admit I prefer to read hard-boiled, noir and suspense crime novels to whodunits. Once in a while I read also whodunits and enjoy them. My list is just a suggestion, alternative suggestions are welcome. I am glad to get to know titles of essays I have not yet read. Must say I’m flattered to have my piece on Gil Brewer included on Josef’s list. Whether or not it’s deserving of the honor, I certainly have no quibble with any of his other selections — though I agree that a list of 50 worthies would be preferable to a dozen. I don’t have a copy available to me, but I am sure I could pick one or two essays to add from the collection in “Murder Ink: The Mystery Reader’s Companion compiled by Dilys Winn. I agree with John that the Sayers Omnibus of Crime 1 should be in there over Gaudy Night. It’s a really major piece of scholarship. Her Gaudy Night piece seems to me rather self-puffery by comparison. Barzun’s essays constitute the most significant defense of the traditional detective novel after 1940 in my view and the man is (he’s alive yet!) a great writer, academic but accessible (a vanquishing quality in academic writing today). I have no problem with Chandler and Auden being there, just with the way the essays have been insufficiently contextualized. Thanks for the reminder about MURDER INK. I don’t remember any specific pieces in it that I might recommend either, but when it came out, I read it cover to cover, and I enjoyed it immensely. A delightful book that certainly contains its own share of opinions! Thanks for the interesting article. The comments were also very interesting to read. I see that I need to do more reading of mystery essays. I love lists like this one and it is one of the reasons that I read and collect literary magazines. Such magazines often publish fascinating articles on my favorite authors. Unfortunately they tend to ignore the mystery genre which is why I really miss my favorite all time mystery fanzine, THE ARMCHAIR DETECTIVE. I still have a complete file and read it every now and then. I miss ARMCHAIR DETECTIVE, too, but the early issues more than the later ones. Those early issues not only had great articles, but it was a meeting place for lifelong readers of mystery fiction who thought they were more or less alone in their passion for their favorite reading material. The letters column was packed with enthusiasm and camaraderie, and friendships bloomed and flourished, many of them lasting to this day. After Al Hubin decided to give it up, TAD was still a fine magazine, but the letters column shrunk to only a pale shadow of its former self. I confess that I let my subscription lapse, after having been one since Volume 1, Number 1. I filled in most of the missing ones later, but I suspect not all. I’ll have to go look and see. My set really should be complete too. Excellent list–I’d include Colin Watson’s book, “Snobbery with Violence”–both a history & critique of the mystery novel. P. Highsmith also wrote ‘Plotting and Writing Suspense Fiction’. Unfortunately I found it hardly of any use; seems to be just her random musings on how some of her stories came to be.